Plan of the town of Harwich in Essex. Harwich was developed in around 1150, (then known as Herwyz or Herewyk) and due to its location on the east coat of England and on the estuary of the rivers Orwell and Stour, it quickly became a thriving port. 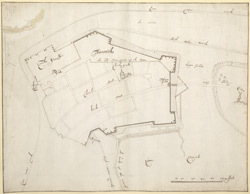 This plan was drawn by a Dutch artist, possibly Sir Bernard de Gomme, in about 1690.